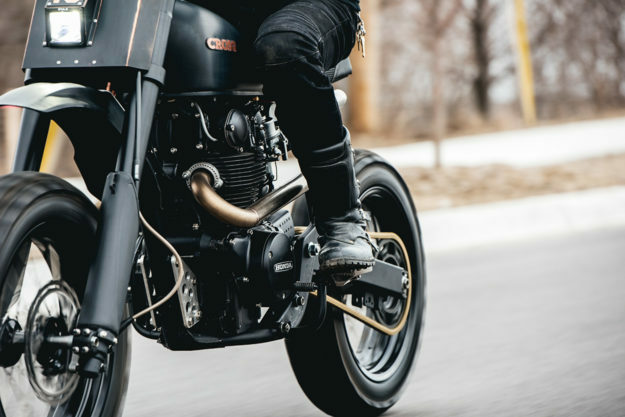 If you love custom motorcycles and feed your addiction via social media, you probably follow Cafe Racers of Instagram. It’s an impeccably curated account with a staggering 850,000 followers, delivering quality images of café racers and customs several times a day. 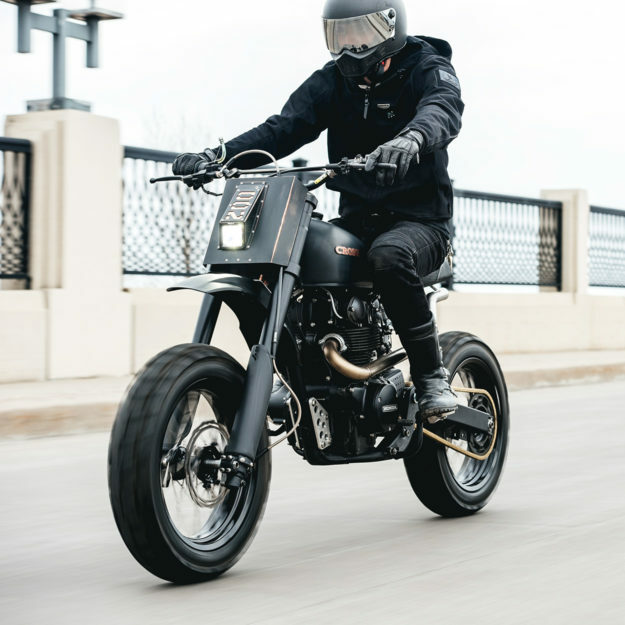 The guys behind CROIG, David and Andrew, are much more than mere pixel pushers though: They’ve been getting their hands dirty building bikes, out of DIY workshop The Moto Collective, in Minneapolis. This heavily modified CB450 is the second outing under the croig.builds label, and there’s already a third on the way. It’s an intriguing approach from guys who spend their working lives examining every kind of custom build under the sun. 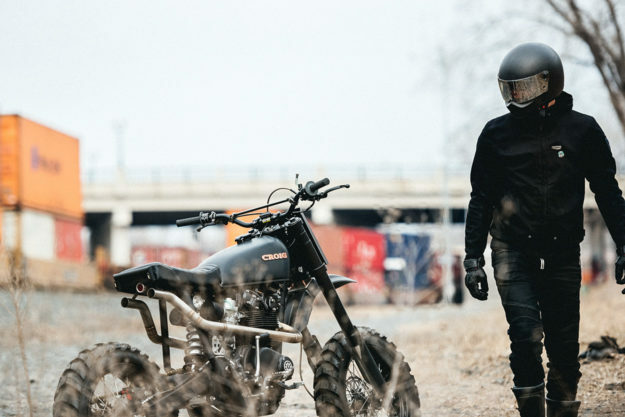 It’s most definitely not a cafe racer, and there are absolutely no fripperies or bling: CROIG’s CB450 is a bike stripped to the absolute basics, being a hybrid on-/off-roader with minimal bodywork. There isn’t even a tail section. 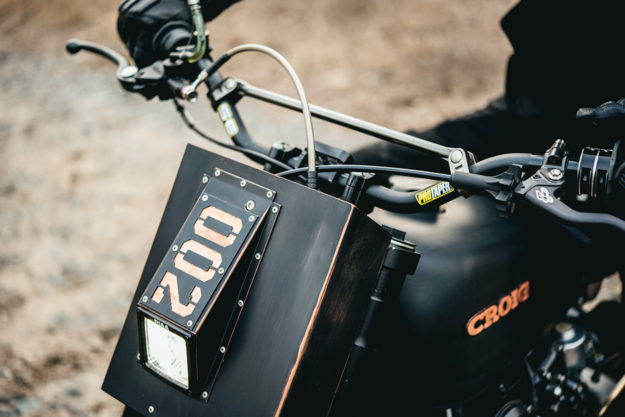 Andrew describes the process of building as “Nothing but problem solving from the start.” First, he stripped the suspension and swingarm off a Honda CR250 found at a salvage yard, and rebuilt it. Then, with a little help from Common Motor of Houston, the motor was overhauled. Next came the challenge of merging the CR250 suspension with the CB450 frame. 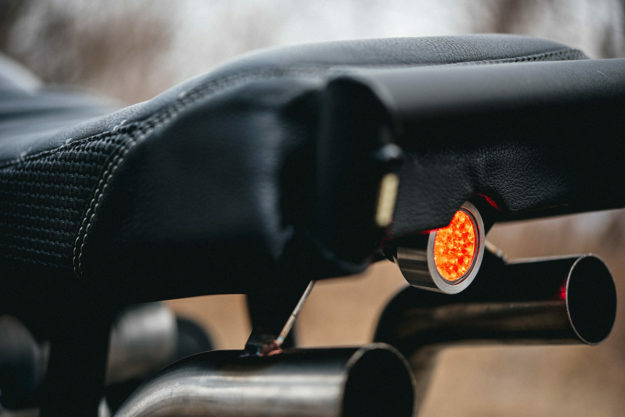 “I did my research and surprisingly, it was pretty adaptable,” says Andrew. To get the CB rolling again, CROIG called up Warp 9 Racing and ordered a set of their 17” supermoto wheels. But with the wide (and matching) front and rear Metzeler Karoo 3 tires, they now had clearance issues with the 47mm Showa inverted forks. 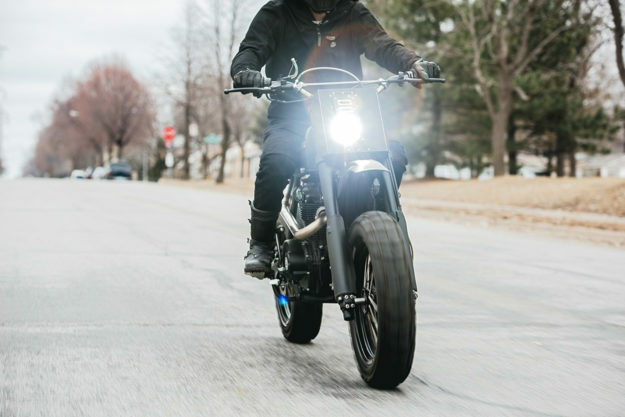 A quick email to Cognito Moto saw the boys rescued with a machined triple tree to accommodate the larger front tire. Keen eyes will spot the CB360 gas tank, taken off a salvage bike, restored and given a satin/brushed finish. Right behind is a minimal seat, upholstered by Nate at Vinyl-Lux. 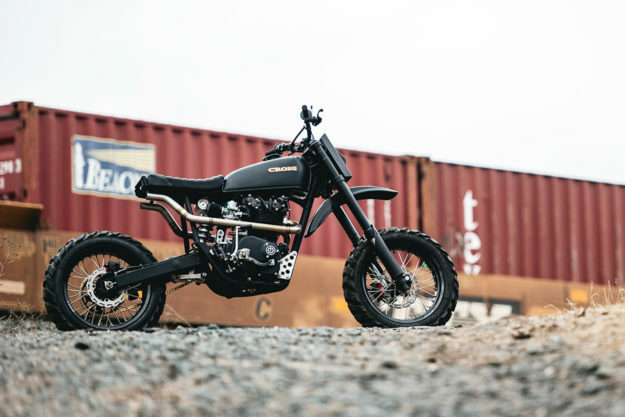 With over twelve inches of suspension travel front and back and a freshly rebuilt motor, we’re betting this CB450 is an absolute hoot—especially off-road. The next build is going to be a Honda Hawk GT NT650. 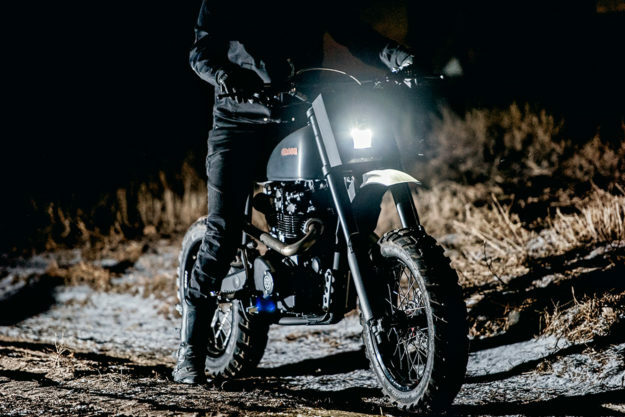 But CROIG’s newest release is digital: a very entertaining clip that injects a radical dose of Daft Punk style into the standard custom moto video (below).